We are stuck in some "Polar Vortex" here in the great state of Indiana. Average snow fall for us is 26" and we've already reached about 34" and winter just started a month ago. Plus, we've been experiencing several days of subzero temps which has caused schools to delay or cancel several times a week since the beginning of second sememster. I don't know about all the other parents, but I'm ready for some sort of routine! Right now the winds are about 40-50 mph which is causing some major drifting and we are supposed to get more snow on Saturday or Sunday. This girl may be ready for summer. Then instead of complaining about sub zero temps, we can all complain about 95 degree days with 100% humidity;0). 1) Put Oreos in a Ziploc bag and seal. Smash the Oreos with a rolling pin. Set aside 1/2 C. crushed Oreos for the topping. 2) Melt butter in the microwave and stir in the Oreos. Press mixture into a 9x13 pan. 3) Make chocolate pudding according to directions on package and set in fridge while you make the cool whip mixture. 4) Mix cream cheese until smooth. Add powdered sugar and mix until combined. Then fold in 1 container cool whip. 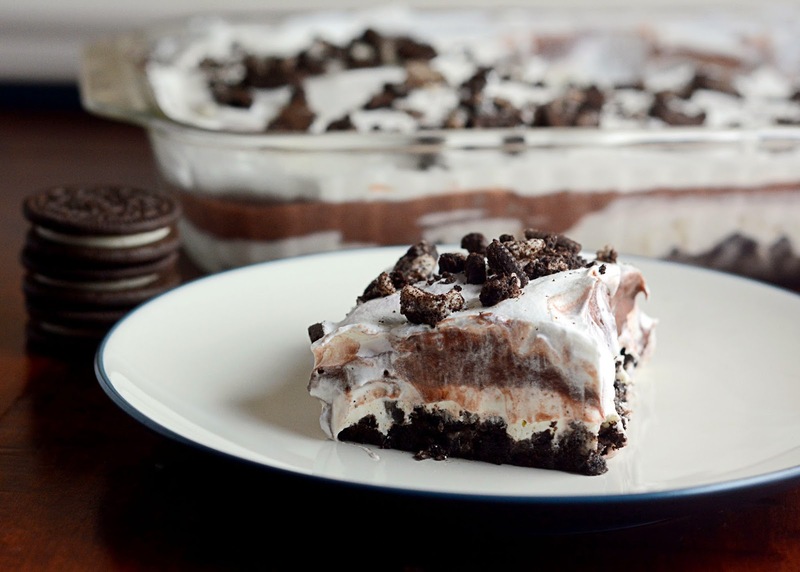 5) Top Oreo layer with the cream cheese mixture. Next, pour pudding evenly over cream cheese mixture. Top with the final container of cool whip. 6) Sprinkle remaining Oreos on top. Keep refrigerated.